Westerns were on my radar very early in childhood. 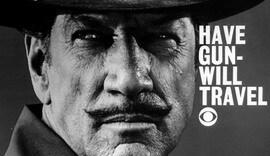 In the first years of the 1960s you couldn't turn on a television without seeing Gene Barry, Richard Boone, James Garner, Steve McQueen, Clint Walker or dozens of other knights without armour in a savage land striding down the main streets of Dodge or Tombstone to face down character actors who had robbed stage-coaches, run sheep herders off their land, stolen maps to gold mines or poisoned a farmer's well. 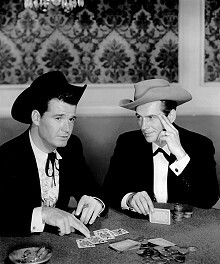 Westerns were the most popular genre on television in those days. Studios could make the shows cheaply on existing sets, they had a lot of jobbing actors who could ride horses, twirl lariats and fan six-guns realistically. All this had a profound influence on the way we played as children. Without the paranoid constraints of 21st Century helicopter parenting, as long as we were home by dark we could go wild and stage gunfights that made John Sturges' Gunfight At The OK Corral look tame. Every boy had a cap gun holstered on his hip, a straw stetson jammed down over his short back and sides and a steely look in his eye. Suburban streets became Dodge City, random pedestrians were shot without mercy and large dogs became horses until they ran away and hid under the house. Surprisingly enough very few of us became serial killers, violent criminals, survivalists or political conservatives in spite of growing up drenched in this iconography of a male-oriented, ultra-violent 19th Century society. I was devastated when I outgrew that shirt. Now, half a century later, I just googled 'Have Gun Will Travel t-shirt' and it seems that I can rectify the situation. All the things you remember from childhood are now on the Internet somewhere. So westerns were a part of my upbringing as much as vegemite sandwiches, battered saveloys with a minimum of chips, room temperature school milk and the change to decimal currency. When I found a whole new lot of 1950s westerns to enjoy in 2014, I was as happy as a bartender on cowboy payday. Thanks to Martin Scorsese, the 1950s westerns directed and produced by Oscar "Budd" Boetticher have been re-evaluated by film buffs. 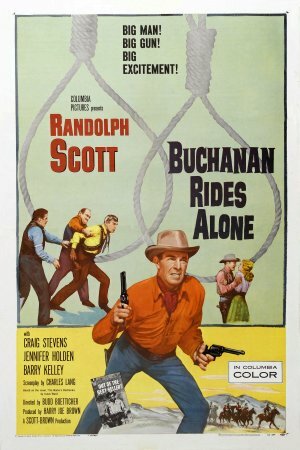 These seven films: Seven Men From Now, Buchanan Rides Alone, The Tall T, Ride Lonesome, Comanche Station, Westbound and Decision At Sundown are remarkable. Low budgeted, filmed in eighteen days over three weeks and with short running times, these are westerns pared down to a lean, highly entertaining efficiency. In that, they resemble the actor who starred in them, Randolph Scott. Scott's heroes are knights errant, weathered ageing men with hard-won skills, tragic pasts that define but do not impair them and in sometime cases, they have hidden agendas. Even in company, they ride lonesome. They choose their own paths and loyalties. They are aware of their limitations even while they exceed them. Scott's characters are the template from which later movie heroes are stamped, particularly John McClane in the first Die Hard movie. Boetticher created a unique cinematic universe. The antagonists are rarely evil. Most of the time they're similar to the hero but have made the wrong choices somewhere along the line. The secondary characters are well fleshed out and the women are their own people with a strength of character rare in westerns. All of the landscapes are vivid and strongly defined. Filmed on the west side of the Sierra Nevada mountains in the Alabama Hills these movies make geography one of the characters. Boetticher often filmed broad vistas with the action in the middle distance. Without showiness, he conveys a sense of space, distance and isolation. Action scenes are carefully planned out using tumbles of rocks, rivers, trees and weather-worn buildings strategically. 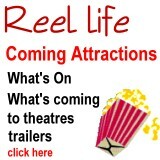 This gives a clarity to the action that is rarely matched in action cinema. You can accurate draw maps of the locations in a Boetticher western after watching it. 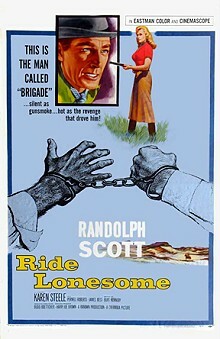 Randolph Scott is an interesting protagonist for these films. Already in his late 50s when the Ranown Cycle started, he plays his characters stoically but with surprising bursts of emotion. Using the less is more approach he seems as hard and immovable as the canyons and arroyos he rides through. As the movies unfold he rarely reveals his character's motivation. Other characters speak of the reasons he does things but Scott's protagonist rarely does. His implacable bounty hunter Ben Brigade in Ride Lonesome is iconic. Other characters think that his motivation for the manhunt he embarks upon is the bounty for Billy John (James Best). It isn't. Billy John is a means to an end. The cowboys who ride with Brigade, Boone (a pre-Bonanza Pernell Roberts) and Whit (James Coburn in his first movie role) are complex characters who weigh up their chances of taking Billy John away from Brigade to claim the bounty for themselves. They like Brigade and killing him to get Billy John would mean crossing a moral line. These moral boundaries are important in Boetticher westerns. Trust in the men you ride with is crucial. In Decision At Sundown, Scott plays Bart Allison one of the darkest protagonists of the Cycle. Allison's wife has committed suicide after an affair with Tate Kimbrough (John Carroll). Allison has tracked Kimbrough down to the town of Sundown on Kimbrough's wedding day. With his friend Sam (Noah Beery Jr) he rides into a town that Kimbrough essentially owns. The corrupt sheriff (Andrew Duggan) lays siege to the Livery Stable where Allison and Sam hole up. As negotiations begin, the mood of the townsfolk shifts away from Kimbrough. Allison is the catalyst for a change in the community but at great personal cost. When the inevitable showdown occurs in the street, the gunfight takes a tangential turn which is unexpected but logical. Comanche Station has Scott playing Jefferson Cody, a man whose wife was captured by Comanches a decade before. He now spends his life freeing white women captured by Indians. Nancy Lowe (Nancy Gates) is one of these women. He buys her off the Indians. Her husband has posted a $5000 reward for her return but never looks for her himself. Ben Lane (Claude Akins) wants the woman for the reward. Charming and cunning, Lane questions the motivations of Cody and Nancy's husband. But things aren't as they seem and after the climactic confrontation, the movie ends on an explanatory grace note that lifts this western way out of the ordinary. 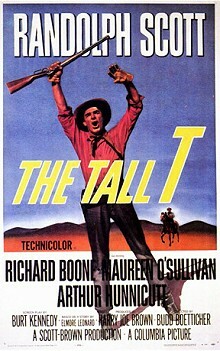 The Tall T had the solid foundation of being based on a story by Elmore Leonard. Scott plays Pat Brennan a cowboy with a small spread who visits town to buy a 'seed bull' from the Tall T ranch. Losing his money in a bet with the ranch owner Tenvoorde, he hitches a ride with an unscheduled stage-coach hired to take a newly wed couple (John Hubbard and Maureen O'Sullivan) on their honeymoon. The coach arrives at a station Brennan had visited on the way into town only to find three gunmen Usher (Richard Boone), Billy Jack (Skip Homeier) and Chink (Henry Silva) waiting there to rob the next scheduled stage. The plan changes to ransom when they find that Mrs Minns (O'Sullivan) is the daughter of a wealthy mine owner. Brennan is a much lighter role for Scott. Unburdened by the tragic pasts of other Ranown protagonists, he is a slightly more comical figure in parts. While Mr. Minns (Hubbard) delivers the ransom note, Brennan and Mrs Minns are imprisoned in the outlaw hideout, giving Usher time to talk with Brennan, whom he likes. In a good casting choice, O'Sullivan's Doretta Minns is a woman in her early forties. Tired of being lonely, she married Minns because he asked. She was fully aware of his flaws and makes the choice freely. What looks like a cliché, the wealthy spinster conned into marrying a gold-digging younger man, becomes something different. Because she makes the choice, she marries on her own terms. Like all the women in the Ranown westerns, she makes her own destiny. She is not there as a reward for the hero. When Brennan suggests she use her gender to trick one of the kidnappers into a vulnerable position, she sees the logic and necessity of doing so. 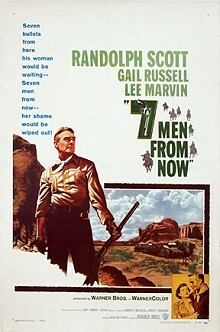 In Seven Men From Now, Scott goes up against another iconic western actor, Lee Marvin. In this one he is Ben Stride, a former sheriff blames himself for his wife's death during a Wells Fargo robbery. He tracks down and kills the seven men responsible. On this vendetta he meets and helps John and Annie Greer (Walter Reed and Gail Russell) a couple heading for California alone by wagon. The mutual attraction between Annie and Stride conflicts with her loyalty to her husband, who is hiding a secret that endangers them all. When the trio meet Masters (Marvin) and Clete (Red Barry), Annie learns Stride's back-story and why he obsessively hunts them men who killed his wife. There is less ambiguity in the villains of Seven Men From Now. The ambiguity is in the morality of John Greer and how his weakness threatens his own future and that of others. Buchanan Rides Alone and Westbound are lesser works. In the former, Scott is Tom Buchanan, a man travelling home with hard-earned money to buy himself a farm. 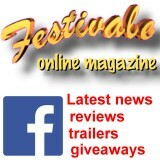 He stops at the town of Agry, run by the Agry family and finds himself jailed on a murder charge. 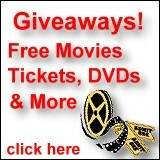 Westbound is the Ranown western that suffered the most studio interference. Scott's character is less of a loner and outsider and working to keep a stage-coach line open during the Civil War, his hero Captain John Hayes is a much more prosaic character than the others. But overall, the Ranown westerns demonstrate virtue in their simplicity and the strength that comes with solid writing that, for the most part, avoids cliché. At the heart of five of these movies is a mystery and for the most part, those mysteries are in the heart and history of a troubled man. Like many good films, I don't want to re-watch them too often. Too much familiarity would spoil the magic.